Jonathan Partain, M.D.’60, BA ‘57, wanted to use his medical degree to do something good for people when he moved to Orlando, Florida, in 1968 to start his own practice that would become the Orlando Heart Center. That was the same year that Walt Disney had been secretly buying swamp land in Orlando area in preparation for the construction of Disney World opening in 1971. “I didn’t really know what I was doing. My stepfather had moved to Orlando for his job, and I had come to visit. I just thought it was a good place. I was teaching at University of Virginia at the time and was ready to try something different. I only knew one other doctor in town. Of course, I didn’t know how big this area would become,” Partain said. Partain said he can’t take credit for his prosperity nor did he plan on his practice blossoming into four locations and 25 cardiologists, keeping pace with the population boom in the area. Instead, he credits his success in part to the many people who believed in him when he was young and unproven. From the Orlando banker who loaned him $10,000 when he walked in off the street so he could open his practice, to the team of doctors and nurses he hired, to the Vanderbilt faculty at the School of Medicine—each played a role in his achievements. 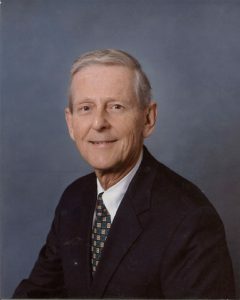 In particular, he recalls that John Patterson, M.D., then dean of the School of Medicine, believed in him and offered help with the cost of medical school tuition. Partain received support from the Thompson & Green Scholarship Fund for his tuition which was distributed at the discretion of the dean to promising students who needed financial assistance. The Thompson & Green Machine Co. was a prominent Caterpillar tractor retailer started by DeWitt Thompson Jr., and George Green in 1944. Instead of sending calendars or other small thank-you gifts to its many customers during the holidays, Thompson wanted to give the gift of more doctors. He created a fund at Vanderbilt for need-based scholarships for medical students from Alabama, Kentucky and Tennessee. Today, Partain, with his wife Virginia, also support others through their own scholarship—the Jonathan O. Partain and Virginia G. Partain Scholarship. Six students are studying medicine this year because their scholarship made it possible, just as the Thompson family invested in Partain’s journey. “Vanderbilt was integral to my success. My experience was outstanding and the faculty were really good people who were instrumental in helping me do well. I realized how important Vanderbilt was to me and to everything I accomplished. So after I retired, we gave a gift of $1 million for a scholarship that reflected our feelings about philanthropy and the School of Medicine,” Partain said. “I have always just wanted to help people. It was why I became a cardiologist. It is why we created a scholarship. It’s why I volunteer every week at a low-income health clinic,” he said. By setting out with the help of a few friends and with the intention of simply doing good, Partain assured his own success and that of future generations of talented students who will benefit from the Partain family scholarship.